The Couture laminated tote has a glossy finish and a beautiful design that shines in the light. Whether you use the bag to carry goods or gifts, the new owner will love it as much as they love what's inside. The bag will last because it's made of thick 105 GSM paper. 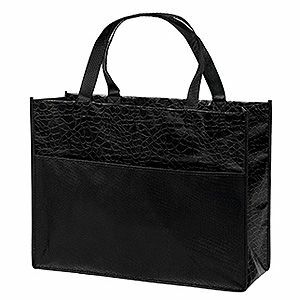 The black tone-on-tone reptile design is unique and perfect for events and gifts. The large front pocket provides even more room and is also where you can place your custom printed design. The 18"" handles make the bag easy to carry. Give a bag that as special as what's inside. Purchase the Couture laminated tote.